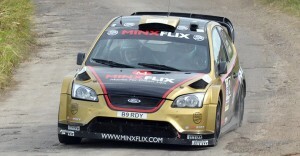 Britain’s Paul Bird repeated as the Sol Rally Barbados champion. His navigator is Aled Davies. A few showers, plenty of brakes and other mechanical problems affected drivers over the two days of the region’s top motoring event – Sol Rally Barbados 2013. But by yesterday evening after two days of gruelling rallying that took in stages in Sailor Gully, St. Peter, Mount Gay, St. Lucy, Groves, St. Philip and Stewart’s Hill, St. John, England’s Paul Bird, along with his Welsh co-driver Aled Davies, had repeated as the June Rally champion having also taken the 2012 title. Bird’s victory was a testimony to his excellent driving, the durability of his car and the efficiency of his crew. Indeed, it was a triumph for the Ford Focus vehicle, as Jamaica’s Jeffrey Panton and navigator Mike Fennell took second position, also in a sturdy Ford Focus. Barbados’ top rally driver Roger The Sheriff Skeete did not add to his more than ten titles, but did well enough, along with navigator Luther Venezia in a Suburu Impreza WRC S12 to take third spot. King of the Hill winners Neil Armstrong and Barry Ward were in fourth position in a Suzuki SX4 WRC, just ahead of the British pair of Englishman Roger Duckworth and Alun Cook of Wales. They contested in a Subaru Impreza WRC S6. The consistent Roger Hill, driving a Toyota Corolla WRC, took sixth position overall and was second among cars in his class. His co-driver was Graham Gittens. The Warrens, Ian and Robert, had a few mechanical issues, but still performed creditably to finish in seventh spot in their Suzuki Swift. Eighth position was taken by the pair of Kevin Proctor and Dave Bellenby in a Suburu Impreza WRC S7, while the top ten were rounded off by locals Josh Read and Mark Jordan in a Toyota Starlet, and the Mayers brothers, Roger and Barry, also in a Starlet. A massive crowd attended the two-day spectacle with several visitors spotted among the local motor sports enthusiasts.